CT101 is a linear 2-channel widebanded audio buffer / preamplifier. 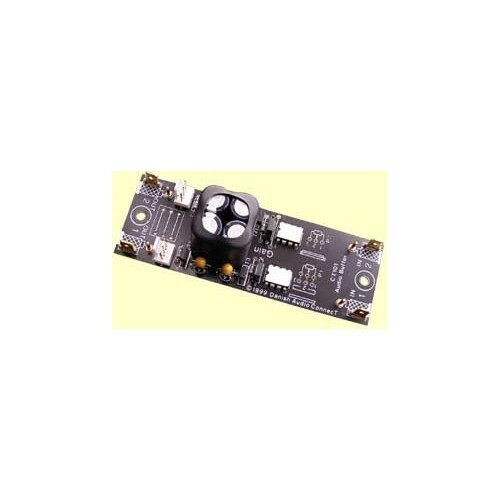 It is built on a compact PCB, which together with the use of SMD components yields a very short signal path. CT101 is built as two mono preamplifiers on one PCB, and can be power by two individual supplies. The active devices are special ICs, and the power supply connections are decoupled with SMD capacitors. High performance gain/buffer preamplifier for CD-players, etc. Use CT101 to build an active high quality 2-channel audio preamplifier. One of DACT?s stereo CT1 or CT2 stepped attenuators may be solder directly onto the PCB (see the photo on the right) to adjust the volume. This is an almost ideal preamplifier for sources like CD-players. You may add DACT?s CT3 audio input selector switch and/or CT4 balance control to make a preamplifier with more features. For detailed application information please see the RESOURCES below.